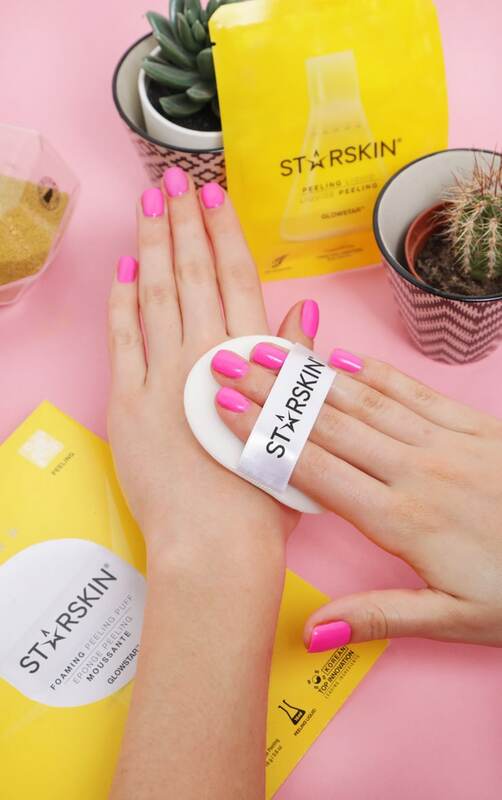 STARSKIN Glowstar™ Foaming Peeling Perfection Puff is a unique patented peeling and exfoliating puff that removes pore-clogging dead skin cells that cause dull skin. A blend of natural Alpha Hydroxy Acids, and Carrot and Broccoli extracts create a rich lather that effectively and safely slough away dead skin, to help visibly reduce wrinkles and brighten skin tone. This easy, at-home treatment can be used twice a week after cleansing, to help boost the efficacy of the organic and innovative skincare routine that follows. Skin glows as if lit from within. The secret to flawlessly radiant celebrity skin, now revealed. Clears clogged pores and buffs away dead skin cells, reusable up to 3 times. Reduces the appearance of wrinkles and reveals radiant skin. Easy-to-use, at home peeling treatment with professional results. Cleanse face and pat dry. Tear open the sachet and add a few drops of water. Gently press on the sachet to create a rich lather. Remove sponge from sachet, and move it gently on the skin in circular motion for 2-3 minutes. Avoid the immediate area around your eyes. Rinse face with water and pat dry. Glowstar™ can be stored back in the sachet, and used up to 3 times before disposal.